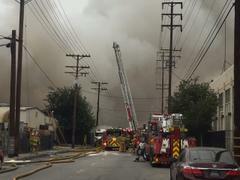 Los Angeles County Fire is battling a 3 alarm fire at the 3500 block of Fruitland Ave, in Maywood. Residents and businesses throughout Maywood and Vernon are asked to shelter in place and stay indoors to avoid unnecessary inhalation of fumes and smoke. Health and Hazardous Materials teams are on scene monitoring for potential hazards. Businesses and Residents of Vernon and Maywood are asked to shelter in place and stay indoors.